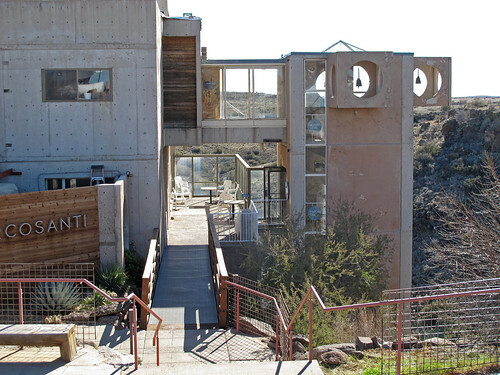 Arcosanti, designed by Italian-born architect Paolo Soleri, is an experimental architectural complex perched on the side of a gulch in the Arizona desert, about 70 miles north of Phoenix. 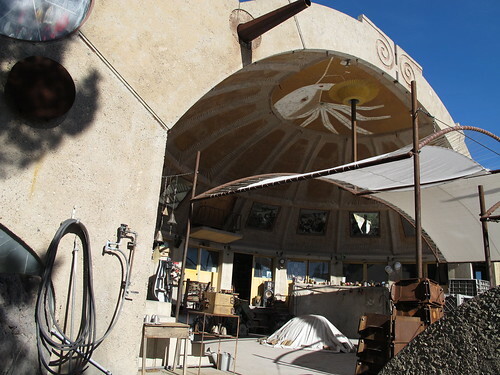 Arcosanti was begun in 1970 as a multi-stage project, but it is not—and perhaps may never be—finished. Ultimately meant to house 5000, it currently houses far fewer but nevertheless still exists as a proposition for a new hyper-dense, ecologically sensitive mode of human settlement. 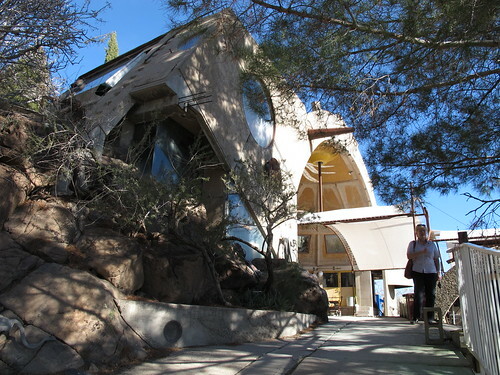 Soleri arrived in Arizona in 1946 to study with Frank Lloyd Wright at Taliesin West in Scottsdale. 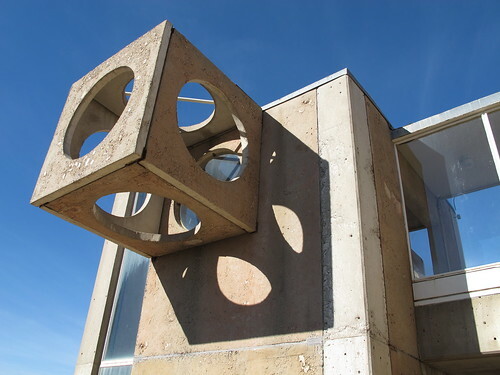 However, apart from a shared interest in making architecture in a manner sensitive to its environment, Soleri and Wright took different paths with Soleri producing complexes distinct from Wright’s both aesthetically and functionally. 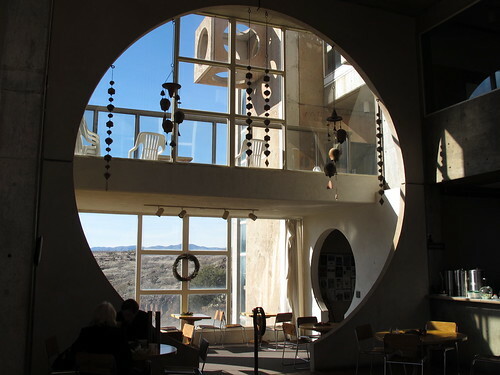 As a friend of mine pointed out, Arcosanti’s concrete circles and arches are more reminiscent of Louis Kahn, though they also remind me of the quasi-islamic desert settlements in Dune. 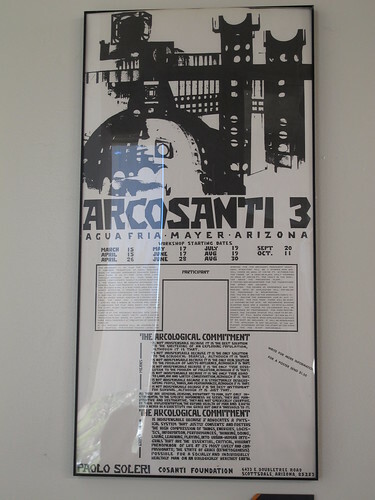 As with the sietches in Dune, Arcosanti is focused on water and resource reclamation. I appreciated the sign above the toilets, warning not to drink the toilet water as it’s reclaimed. Sadly dogs can not read. I’m kidding. It was just nice to see that type of dedicated water conservation in the desert. 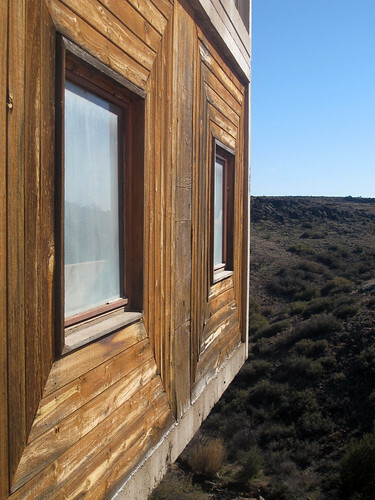 • The fostering of a new and healthier balance between nature and culture through the research and development of appropriate technologies, architectural settlements and compassionate economies for meta-industrial villages and convivial cities. • The illumination of the spiritual foundations of political governance through scholarship and artistic communications that foster a global ecology of consciousness beyond the present ideological systems of warring industrial nation-states, outraged traditional societies, and ravaged lands and seas. 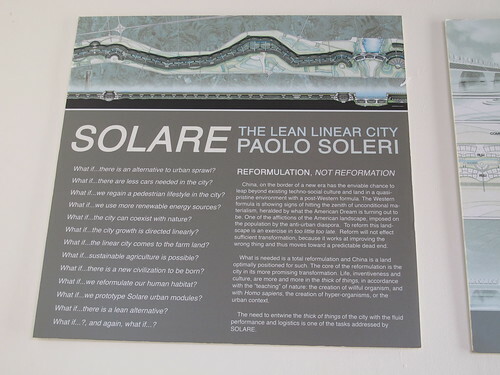 Soleri’s idea was that Arcosanti would house 5000 people comfortably without sprawl and while sitting lightly on the land. It would feature multiple common areas and on-site recycling of resources including water, energy production and general self-sufficiency. 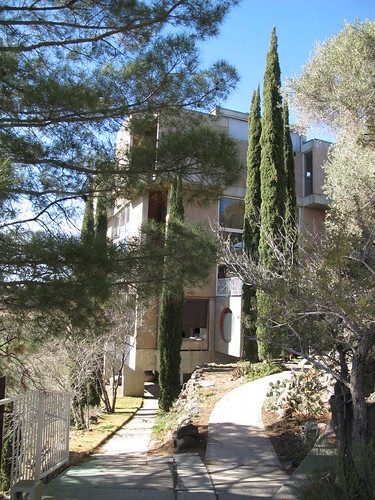 Soleri describes this project as “arcology”—the marriage of architecture and ecology. 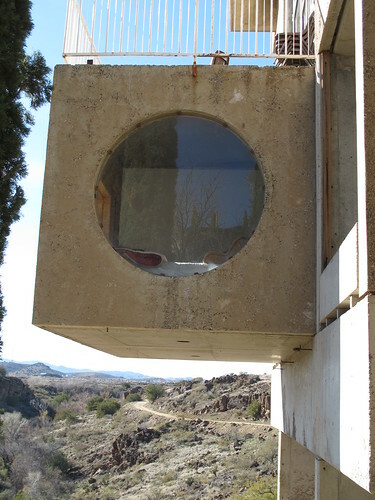 He seems to like that type of neologism, n aminghis Scottsdale home/studio “Cosanti,” a combination of “anti” with “cosa” meaning thing in Italian. 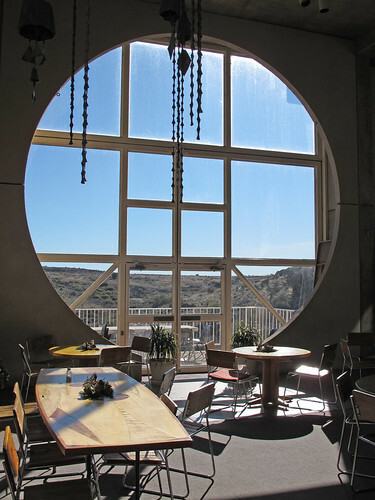 The concept of Arcosanti is interesting, and aesthetically I loved many of its features, especially the huge round windows and the geometic concrete shapes. Aesthetically there are a few things I would change, both internally and externally. The complex’s shape is formally confusing from the highway, almost giving a sense of a debris field, though its aspect resolves as you approach. 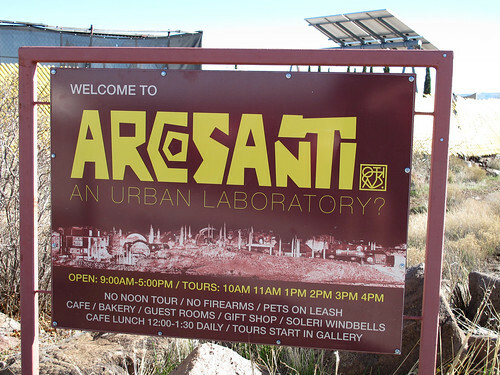 Leaving the highway, you approach Arcosanti via a dry, rather uninviting dirt road. As you get closer, you find a weathered chain link fence made more windproof by a plastic yellow weave flapping in the wind, and we began to wonder if the whole place is abandoned. But beyond the dusty gravel parking lot and some kind of works yard, the actual entrance is quite lovely as you can see below. The interior provides inspiring airy spaces that allow light and protect you from the desert sun. When we were there the place did seem a little forgotten, and though a number of people live there, it had the feeling of an underfunded university—it turned out though that most residents were away for the holidays. The quiet cafeteria was only populated by some Aussies discussing Being and Essence. 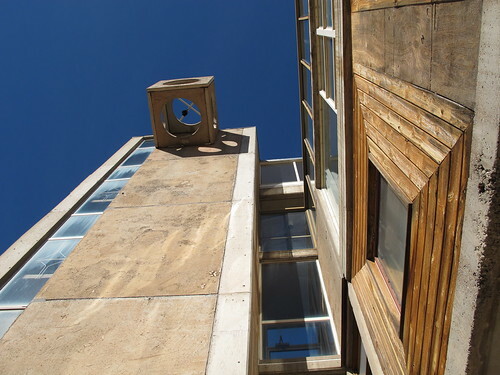 The Cosanti foundation makes income by selling Soleri’s famous bells and windchimes, which are everywhere. Their sale is a major funding source for the complex. The bells sound very pretty but to me have an overdecorated, very specifically folksy/hippie feel incongruous with all the simple geometry, but then the conflict between brutalism/minimalism on the one hand and florid drawings of Gaia etc. on the other has been ongoing since the 60s. The common areas do have a short of hippie, overstuffed couch/bad-art sort of feel. 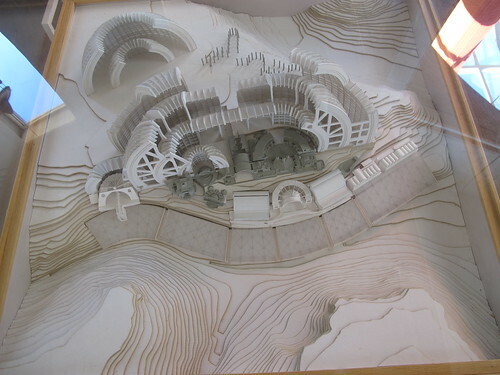 An architect friend said that when she toured the centre she suggested that Arcosanti make money in additional ways, perhaps by enhancing the centre’s influence by hosting workshops or conferences. 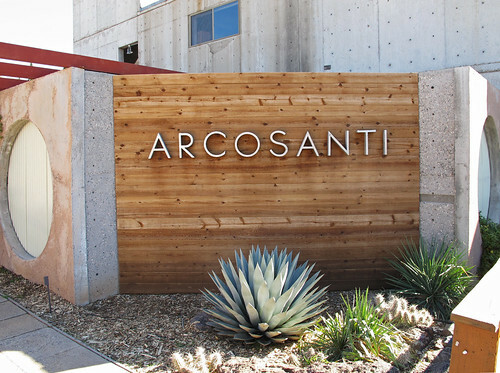 Taliesin West has done a good job of networking and disseminating ideas and there’s no reason why Arcosanti could not do the same. Finally, I was taken aback by the tall pillar cypresses dotted around the complex; they seem really incongruous in the Arizona desert landcape, as if the whole place had been flown in from Italy or Turkey and gave it the feel of an archictectural folly or science fiction set, rather than a settlement in harmony with its specific natural environment. This is particularly noticeable after you’ve driven many miles through that desert to Arcosanti, acclimatizing yourself to the silvery cacti, chaparral and jojoba and scrubby round juniper. I may just be a purist, and I should also disclose that I’ve never liked those trees. These are all minor quibbles. 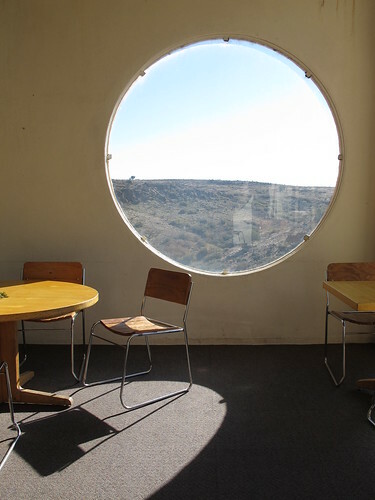 Even when semi-deserted and maintained in less than pristine condition Arcosanti is quite an amazing place, providing comfort in a harsh landscape, and its contribution to the field of environmentally sensitive sustainable design for dense settlements is historically important. 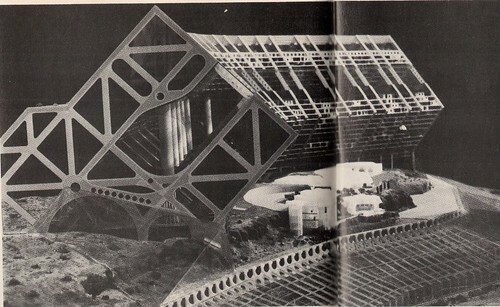 Soleri participated in the UN Habitat Conference on Human Settlements in Vancouver in 1976 and lectured on the Arcosanti project there (see my research website for my upcoming book on that event) along with Buckminster Fuller. This is how I first learned of his body of work. 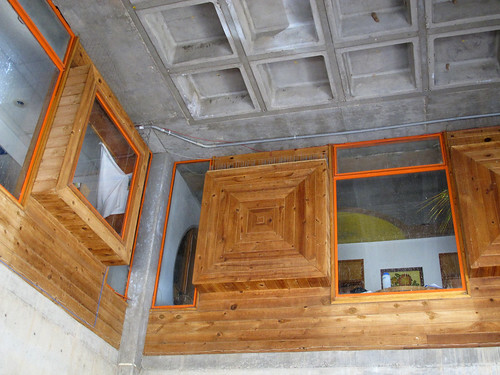 Soleri still lives at Arcosanti and Cosanti. He is 92. Above, imported cypresses flank the main building housing the cafeteria and bookshop. Below, looking in the other direction, part of a metal workshop area where windchimes are manufactured by students and volunteers. Above from Glen on Flickr, originally from Omni Magazine in the early 1980s. Below, bell workshop. 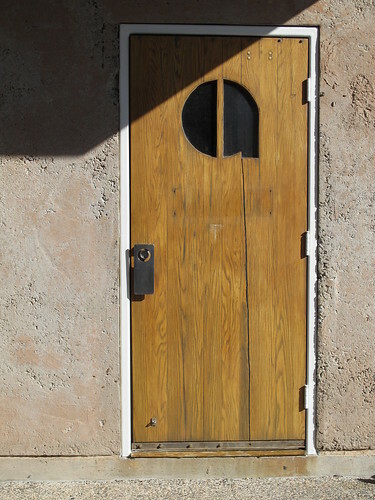 This entry was posted on Thursday, January 5th, 2012 at 1:47 am	and is filed under architect, architecture, design, graphics and signage, landscaping, urban planning. You can follow any responses to this entry through the RSS 2.0 feed. You can leave a response, or trackback from your own site. Beautiful photos of special place. 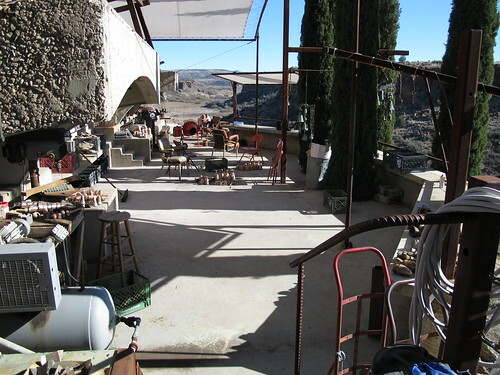 You have captured Arcosanti as a place in a natural setting. Many photos just try to capture the architecture.